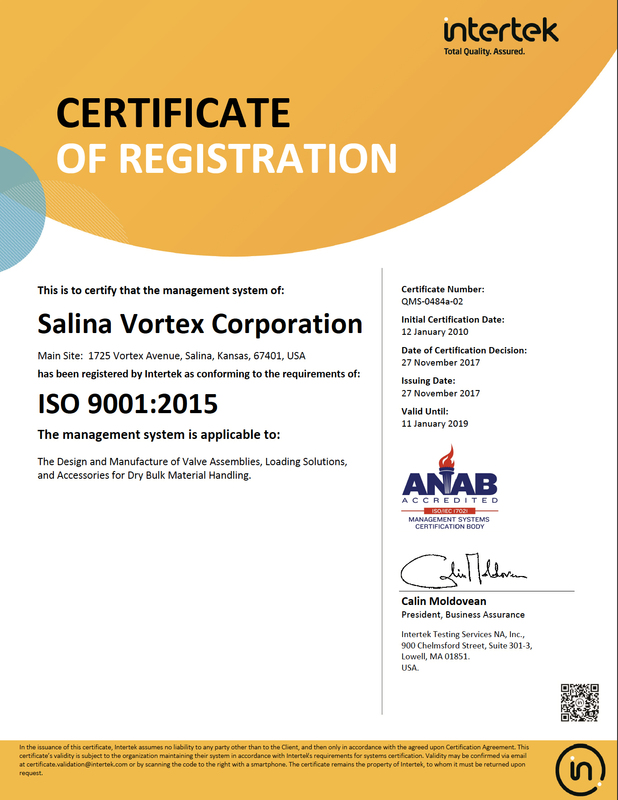 Vortex, Salina, KS, in November gained certification to the ISO 9001:2015 standard. Previously, the company was certified under ISO 9001:2008, and has been ISO-certified for more than 10 years. ISO 9001 is an international standard that specifies requirements for a management system. Through ISO 9001:2015 certification, ISO 9001 acknowledges that Vortex has demonstrated the ability to consistently provide products and services that meet customer and regulatory requirements. In essence, the ISO 9001 standard acknowledges Vortex’s credibility as a reliable and consistent supplier of materials handling equipment and technical services to the dry bulk industry. Among the major changes of ISO 9001:2015 versus ISO 9001:2008 was a transition of emphasis from “preventative actions” and “required documentation” to “top-down leadership and communication” and “business opportunity/risk assessment.” This communication emphasis includes more open dialogue with customers and suppliers, and greater information transparency within the organisation and its shareholders.